The debut title in a new series featuring unseen realms, Norse mythology, and a pair of most unlikely heroes. 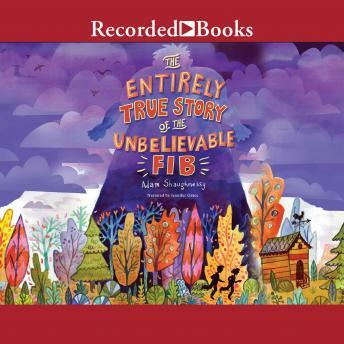 "What is the Unbelievable FIB?" That's the question eleven-year-old Prudence Potts discovers on a baffling card no one else in Middleton--except ABE, a new kid with a knack for solving riddles--seems to see. Then a mysterious man asks for ABE and Pru's help investigating mythical beings infiltrating the town, and that's just one of the things Pru finds hard to believe. Soon Pru and ABE discover another world beneath the surface of their quiet town, where Viking gods lurk just out of sight. They must race to secure the Eye of Odin, source of all knowledge--and the key to stopping a war that could destroy both human and immortal realms. Author Adam Shaughnessy draws from classic lore to create a new world where uncertainty opens the door to magic and the last thing you should do is believe your own eyes. Fans of Rick Riordan and Diana Wynne Jones will delight in the charming characters, abundant puzzles and plot twists, and sly humor of this first novel in a new series.